On Sunday morning Maggie woke up and pronounced it the perfect day to do our annual craft. Tomas laughed at me because he knew right away what she was talking about while I just stared blankly. We do so many, many projects you know. What she wanted was to gather pine cones, and bits & pieces from our garden to turn into magical creatures. And she was right, we’ve been making these for several years — I’d just never thought of them as a tradition before. It is so nice to look at it this way. Our little “rites of passage” for Fall that is fun for visiting adults & kids alike. 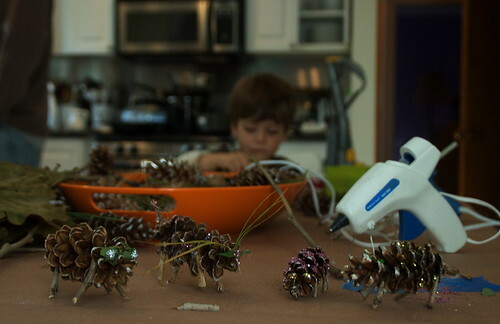 All we do is bring in a big tray-full of nature’s cast-offs, lay them on the kitchen table that’s been carefully wrapped in paper by yours truly, and wield hot glue guns to our hearts content. Tor is a bit young yet for hot glue so I let him direct while I glue, and he controls the glitter. This year we ended up with glitter pretty much everywhere (really, everywhere).